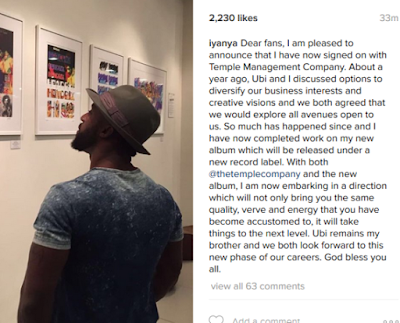 Photos;Iyanya signs on to new management company Temple;Ubi Franklin congratulates him! The Singer has just signed onto a new management company away from his partner of many years Ubi Franklin. 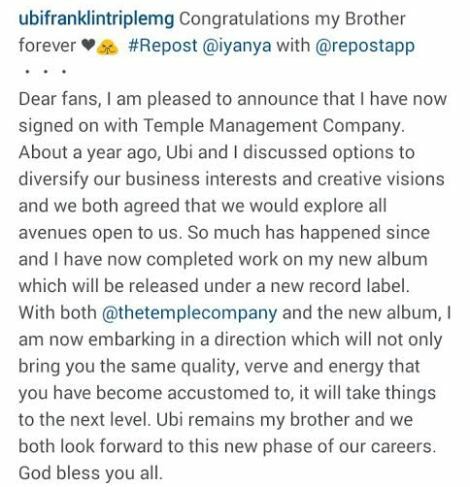 See what Iyanya shared below..
"Dear fans, I am pleased to announce that I have now signed on with Temple Management Company. About a year ago, Ubi and I discussed options to diversify our business interests and creative visions and we both agreed that we would explore all avenues open to us. So much has happened since and I have now completed work on my new album which will be released under a new record label. With both @thetemplecompany and the new album, I am now embarking in a direction which will not only bring you the same quality, verve and energy that you have become accustomed to, it will take things to the next level. Ubi remains my brother and we both look forward to this new phase of our careers. God bless you all." All the best to Iyanya hopefully his new Album showcases the wonderful voice we all fell in love with on project fame many years ago.